St. Venant is a small town in the Department of the Pas-de-Calais about 15 kilometres north-west of Bethune. St. Venant-Robecq Road British Cemetery is on the east side of the main road between St. Venant and Robecq, a smaller village 3 kilometres to the south east. For much of the First World War, the villages of St. Venant and Robecq remained practically undamaged, but in April 1918, during the Battle of the Lys, the German line was established within 2 kilometres of the road that joins them. 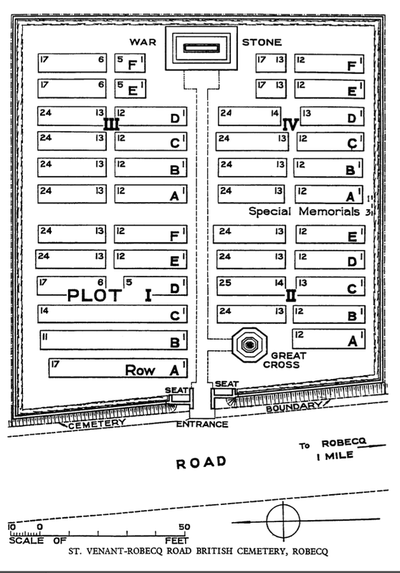 The cemetery was begun around 12 April and used as a front line cemetery until the end of July. 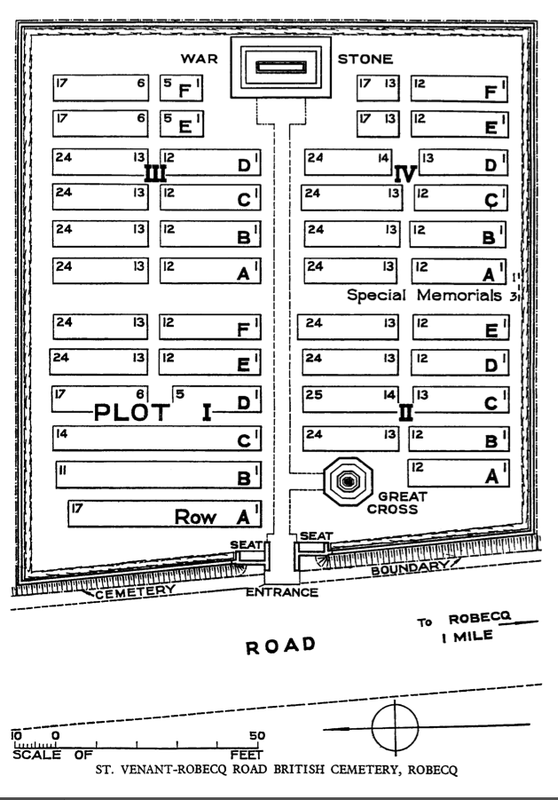 At the Armistice it contained 47 burials, but was then greatly enlarged when graves were brought in from from the battlefields south of St. Venant and from other cemeteries in the vicinity. 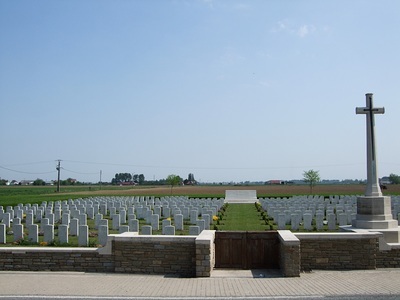 The most important of these cemeteries were LA HAYE BRITISH CEMETERY at St. Venant (65 graves), used by the 2/7th Royal Warwicks and 2/8th Worcesters between April and August 1918, and CARVIN BRITISH CEMETERY, Mont-Bernenchon (54 graves), used by fighting units and field ambulances during the same period. 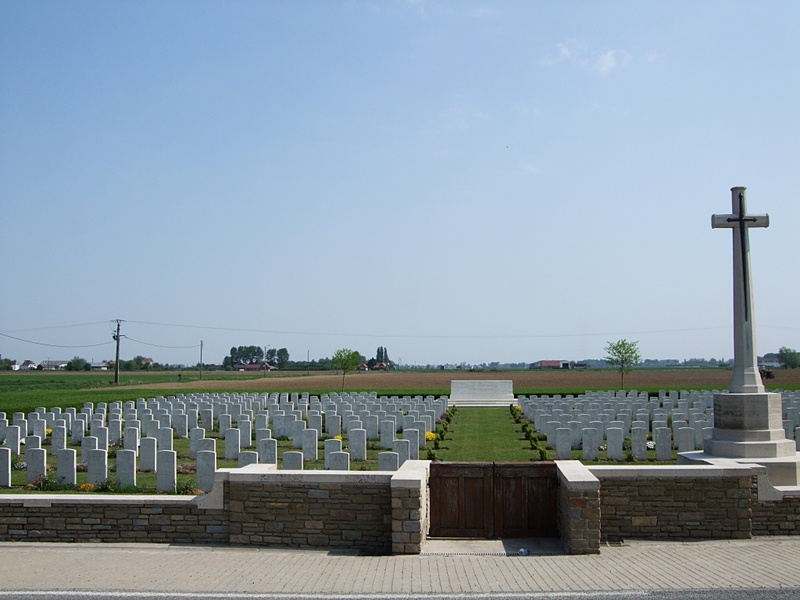 St. Venant-Robecq Road British Cemetery now contains 479 burials and commemorations of the First World War. 85 of the burials are unidentified but there are special memorials to five casualties known or believed to be buried among them. Casualty Details: UK 478, Australia 1, Total Burials: 479. Son of Richard John and Eliza Garbett, of 17, Langley House, Finger Dawley, Salop. 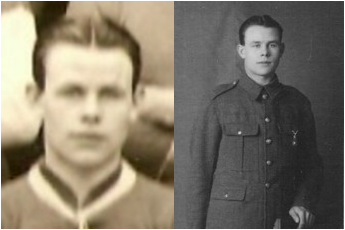 9th September 1918, aged 30. 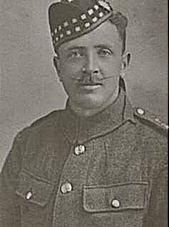 Son of the late Gilbert Sloan Wilson; husband of Jeanie Strachan Young Wilson, of East Park, High Fenwick, Kilmarnock.